For years churches and church consultants have prioritized church growth. I believe most church consulting is done with good intentions. Church consultants, churches, and pastors aim to increase their ministry impact over time by engaging more people with more activities. But at what cost? I would argue that oftentimes the impact has come at the expense of church health. What if your church were to prioritize church health over church growth? How would it affect your ministry if you had a few transformational church health tips to guide your ministry? Below you will find 5 simple suggestions for how you can return to a focus on church health. Feel free to add others or change the ones I have presented here. In our church consulting firm, the Malphurs Group team always starts with one of our favorite church consulting essentials called a church health survey or church ministry analysis where we seek to learn how things are really going in the church. In the same way, I would encourage you to stop and use a church health survey to ensure you’ve laid a proper foundation for your church’s future. Pastors navigate numerous challenges on a daily/weekly basis. They get busy, and they can easily find themselves overly focused on DOING ministry at the expense of BEING a growing disciple. If the pastor isn’t growing, it’s unlikely the church is doing well growing spiritually. (This is not always true, but frequently is the case.) That is why this list of transformational church health tips begins here rather than with a focus on the congregation. Ensure that someone in your church regularly encourages your pastor to keep a steady walk with God. Many pastors will say thanks and inform you that they appreciate that you care. Ask your pastor about what truths from God’s Word have recently stood out. Take a few minutes to sit and listen. You’ll probably surprise your pastor (in a good way) and bless your pastor by doing this. Many pastors struggle with carving out the time they need to invest in their own spiritual growth. In this case, don’t condemn or judge your pastor as an unspiritual failure that needs to get their act together. None of us are perfect. Offer to pray for/with your pastor and offer to do something to alleviate your pastor’s workload. (You might find yourself visiting someone in the hospital or running a simple errand to lighten your pastor’s load). Feel free to also take a look at our list of 25 ways to encourage your pastor. Church leaders don’t have it all together. We are foolish if we assume they do. There is no such thing as a perfect church leader, who consistently knows exactly what to do. Make sure every member and attender has access to a clear scripture study plan. The Bible is a huge book with endless text containing life-changing truths. God’s Word is powerful and a treasure trove for spiritual growth. As a church leader you know this, but the average person struggles with where to start. Make sure everyone has at least one or more helpful resources to get started, to start again, or to lead someone else in a study of Scripture. Ensure your presentation of the plan creates a sense of excitement and motivation — not condemnation or failure. These statements aren’t necessarily evil or malicious. But often people “hear” something very different than what is said. They hear people saying “You shouldn’t be taking so much vacation. You should be working harder.” When they “hear” this (even if it isn’t what was said), the long-term takeaway is to feel guilty for taking time off to rest, to spend time with family, or to spend time in prayer on a retreat. We should never make people feel guilty for resting. We want others to take vacations. We want people to rest. When people rest, they think clearer, sleep better, and re-align their lives with their values. They return to “normal life” with more balanced priorities and schedules focused on what matters most. Christians who get sufficient time to rest tend to lead healthier lives. Encourage this type of behavior — among church staff, as well as the congregation. Consider integrating rest into your work plan…if you haven’t already. You won’t regret it. I’m afraid that many churches have a tendency to “over-program” their people to the point of burnout. Can you recognize the signs of burnout? When we emphasize one activity after another, we apply the rat-race treadmill of corporate America to the spiritual life of the church. Not good. Make sure you are being intentional about avoiding burnout and leaving room to grow. Consider canceling a ministry or a ministry event to provide your volunteers with some downtime. Encourage small group or missional community involvement for every member of your church. Get church leaders to ask people a simple question: “How would you like to grow spiritually in the next 3-6 months?” This question will foster an environment of spiritual growth rather than program addition. Create opportunities for prayer (even on Sunday morning). I can count on only one hand how many church services I’ve been to that created a 3-5 minute space for everyone to stop and pray in groups of 2, 3, 4, or 5. Consider providing this opportunity for your church body to connect with God and each other. 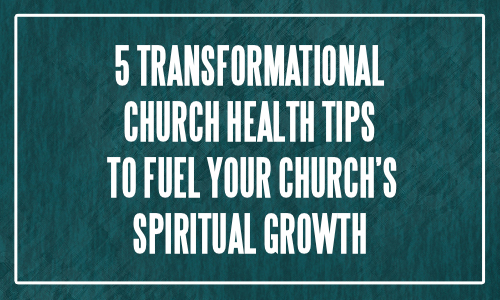 Which of the transformational church health tips do you need to work on the most? How could you transfer these church health tips from an online article to a transformational church process that impacts lives (especially yours)?